Knoco stories: KM vision statements, numbers 16 to 45. Number 37 is so simple, it's elegant! KM vision statements, numbers 16 to 45. Number 37 is so simple, it's elegant! 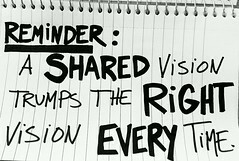 In December 2011 I wrote a post titled 15 Knowledge Management Visions. Here are 30 more to add to the list. All of these are vision statements for organisational KM programs, forming a core part of the respective Knowledge Management strategies. Some of these were appended as comments to the original blog post, others are more recent additions. My favourite is number 37 - so simple! The Vision of NCI Agency’s Knowledge Management is of customer satisfaction through knowledge superiority, the Mission is to deliver customer-focussed and cost-effective solutions through collaboration and knowledge sharing. UNESCO’s KM and ICT vision is to enable programme planning, delivery and evaluation in the most efficient and effective way, through the full and innovative use of information and communication technologies and the implementation of Knowledge Management based on a knowledge-sharing culture. This will allow UNESCO to be a modern and learning organization, capable of adapting to the changing world and playing fully its role within the United Nations system. Our vision is to harness the body of knowledge and exploit it at point of need so that the right information will be available to the right people in the right format at the right time. We believe that the effective management of knowledge and information is essential for the provision of the best patient care. to ensure that ECA becomes and remains Africa’s premier think tank, consistently generating top quality, thoroughly researched products reflecting the latest thinking on issues relating to Africa’s transformative agenda. What does Knowledge Management mean for our employees? Access to quality information and knowledge that has been validated by internal experts. What does Knowledge Management mean for our customer? Potential cost savings by implementing lessons learned on previous projects at earlier stages of the design. Greater exposure to the knowledge and expertise of 130 engineers across 8 regional locations. More efficient delivery of our design. What does Knowledge Management mean for our project partners? Exposure to rationale, lessons learned and local knowledge across our organisation. Potential cost savings due to better quality information at all project and design stages. OUR KNOWLEDGE MANAGEMENT VISION: To be recognised as a world class road authority, working innovatively with industry, our partners and the community, to share and build cutting edge knowledge and expertise. The UN-REDD Programme partner countries develop REDD+ readiness and implementation capacities aligned with UNFCCC requirements, through the systematic identification, capture and sharing of REDD+ related knowledge. FAO will facilitate the access to and exchange of knowledge, as well as its generation, in the domain of agriculture and food security. It will assist its Members in generating, accessing and utilizing knowledge in food and agriculture, as well as any other knowledge that relates to it, required to address Members‟ individual and collective development and food security goals. We manage and share knowledge to maximize McKnight’s credible influence in support of mission and programs. KM: Promotes and strengthens our capacity to learn, question, investigate, share and innovate based on our organization´s culture in order to generate long term value for clients, stakeholders and workers. All employees will have access to the information, knowledge, and processes they need to achieve their individual objectives and help AspenTech meet its strategic goals. ACCCRN partners will collaborate to build a recognisably credible knowledge base of practical and actionable know-how to meet key climate change urban resilience challenges that will ultimately improve the lives of poor and vulnerable people. The Parliament is an open and competent knowledge organisation with a co-operation oriented work culture and the capacity and will to learn. Our vision is to have a knowledge sharing culture that is recognised and respected globally by industry, our clients and our people. We will have behaviours, technology and processes that will connect our global expertise and the right information will always be in the right hands at the right time. Through our people, knowledge and expertise, Lloyd's Register’s performance will continuously improve. The vision of the Office of NE KM Program is to benefit the NE programs by providing scientists across the community with the information required to assess and analyze the accuracy of advanced nuclear energy systems and associated capabilities. A knowledge-enabled force – one learns, everyone knows. The vision of CIDA is to be "a knowledge-driven organization". Comcare will create, capture, share and reuse knowledge to support effective and agile evidence based decision-making. We will increase the efficiency and effectiveness of our people and deliver high level service to our community. GPET will be a learning organisation where the outcomes of previous projects and research inform future work. Staff will have easy access to information to allow them to do their work. This will include embedding procedures and guidelines into workflows and the ability to find the latest authoritative information across the organisation. Stakeholders will be able to capitalise on learnings across GPET programs to inform or establish best practice in GPET and their own organisations. The DON vision of KM is to create, capture, share, and reuse knowledge to enable effective and agile decision-making, increase the efficiency of task accomplishment, and improve mission effectiveness. Connected 24/7 to information, knowledge, and training.